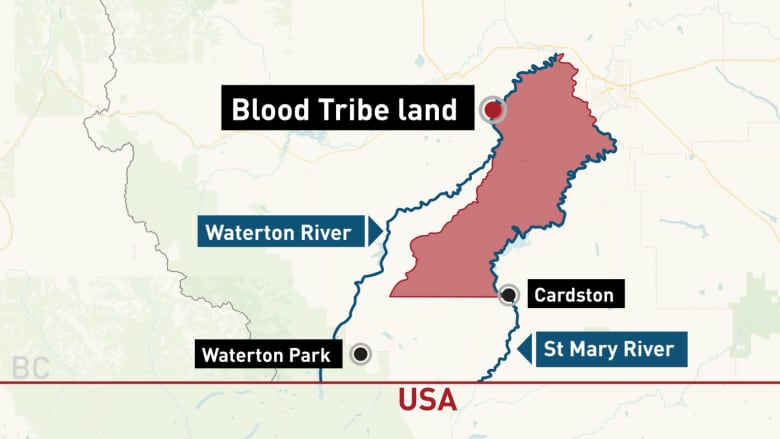 The Blood Tribe, the largest First Nation in Canada, is seeking a major land claim in southern Alberta that would cover a much bigger swath of prairie landscape, including the town of Cardston and part of Waterton Lakes National Park. In the Blood Tribe's oral history, there is the story of Blood Clot. He was swallowed whole by an animal and escaped by slicing its belly open with a knife. According to the legend, the beast's intestines spilled out and became the Belly Buttes of southern Alberta. The traditional home of the Blood people. "Within these lands, the Blood Tribe was created, and it is within these lands that the Blood Tribe developed both a practical and a spiritual existence," states a 2007 report by the Indian Claims Commission on the band's boundaries. "To the Blood Tribe, the home base is sacred." The band occupies the largest reserve in Canada, stretching 1,400 square kilometres across the Alberta prairie. It's bigger than the cities of Vancouver, Calgary and Montreal combined. But the band believes its territory should be far bigger — and it has been fighting the federal government for decades, over lines drawn on a map roughly 140 years ago. Those lines have massive implications today. The First Nation says a town of 3,500 people, several rural communities and even part of a national park are inside the boundaries of what should have been its reserve. If the band wins the fight, it could be in line for compensation of losses dating back to Western Canada's earliest days. The federal government rejects the claim. Since the band started seeking the land claim in the 1970s, Ottawa has repeatedly argued the Blood Tribe isn't legally entitled to any more territory. Now, for the first time, a Federal Court in Calgary is hearing the case. It's a fight over the arc of history. At the heart of the case is the story of how the dominion government settled the west, how rapid development helped give rise to the Blood Tribe's reserve, and how the band became unlikely neighbours with early Mormon settlers. It's also a story about land surveys, promises, expectations and misunderstandings. "This trial is about an unfulfilled treaty promise made by Canada to the Blood Tribe," Gary Befus, one of the band's lawyers, told the court. The federal government says the current reserve already fulfils those obligations. "Canada will request that this case be dismissed because, in the end, the evidence will show that the Blood Tribe received all of the land that it was promised and entitled to under Treaty 7," federal lawyer Marianne Panenka said in her opening arguments in Calgary in May. Treaty 7 was signed years before the Blood Tribe settled on a reserve, but the court case turns on whether the dominion government set aside all of the land the band was legally entitled to under the terms of the treaty. It's a question with no easy answer. What follows is an account on opposing views of that history, based largely on court transcripts, some observations of the trial and an independent report on the dispute. Lawyers and officials on both sides declined to comment beyond written statements. In Federal Court, lawyers and witnesses are poring over century-old government reports and handwritten letters, many of them with fading text, to understand the true intentions of John A. Macdonald's pioneering Conservatives when they opened up southern Alberta for settlers. The court is also contending with a canon of the Blood Tribe's oral history — passed down over generations — which its lawyers say is the most authoritative source of knowledge of the band's past. But oral history can be imperfect. The Federal Court trial began in 2016 in the townsite of Stand Off — the largest community on the Blood reserve and the home of its government. Federal Court Justice Russel Zinn heard weeks of evidence from Blood Tribe elders and even toured some of the land at the centre of the claim. After a two-year hiatus, the case has now moved to a Calgary courtroom. At various times in the trial, band members have packed the courtroom, thanks to shuttles that have ferried them back and forth from the reserve. But they've also been given extraordinary access to the proceedings, with a live video feed available online. At one point, members watched testimony from a Jumbotron at a community building in Stand Off. The trial has opened a new window into the Blood Tribe's past. The court has heard that before European settlers arrived, three bands that form the Blackfoot Confederacy — the Kainai (Blood Tribe), Siksika and Piikani — occupied a breathtaking expanse of western landscape. Together, their traditional territory stretched from the Rocky Mountains in the west to Cypress Hills in what is now southwestern Saskatchewan. And from the North Saskatchewan River down to the Yellowstone River, now south of the U.S. border. When the dominion government opened up the west for settlement, surveyors, agents and commissioners were charged with reserving land for Indigenous communities. Macdonald's cabinet directed senior officials in 1880 to assign a reserve to the Blood Tribe near Fort Kipp, north of what is now Stand Off, "in accordance with their desire." Blood Tribe elders have long held the band's desire was an immense swath of southern Alberta. The band claims its land encompasses everything from the St. Mary River in the east all the way to the Waterton River in the west. It also believes its southern boundary extends to the U.S border. This vast territory is what the band calls the "Big Claim." Translated into Blackfoot, it's called the "Big Theft." The Big Claim extends into what is now Waterton Lakes National Park and into many long-standing communities, including the historically Mormon town of Cardston, which is home to about 3,500 people. The Blood Tribe says all of this land should have belonged to the band. "When the Blood people see the landmarks of Belly Buttes and (Montana's) Chief Mountain, they know they are home," Joanne Crook, a Blood Tribe lawyer, said in her opening statement on the band's land claim. Blood Tribe lawyers argue the band believed in the late 19th century that Treaty 7 allowed its members to continue living on what they called the Big Claim lands. Even if the treaty didn't offer these assurances, the band believes, at the very least, its southern boundary should have extended farther toward the American border. This claim — that the reserve should have stretched into what became the town of Cardston, and beyond — was upheld by the non-binding Indian Claims Commission in 2007. But the federal government rejects all of the First Nation's arguments. "Canada fulfilled all of its treaty promises, was fair to the Blood Tribe and acted in accordance with all of its fiduciary duties," Panenka said in her opening statement on May 15. To understand this dispute, it's important to know the historical context. It all happened during a period of immense change for the newly created nation of Canada. Panenka said when the dominion government set about establishing the Blood Tribe's reserve, it was also "attempting to settle all of southern Alberta at the same time, and so their task was massive." "Settlers were arriving and vying for land," she continued. "It was important to the government to set out land for the Blood Tribe as quickly as possible to avoid conflicts with these settlers." At the same time, the Blood Tribe's way of life was in upheaval. "The buffalo, long the mainstay of their lives, was becoming extinct," says the 2007 report by the Indian Claims Commission. "Colonization and settlement brought whiskey traders and new diseases to the area. The Blood Tribe suffered from a smallpox epidemic, greatly reducing its numbers." As Macdonald's nation-building railroad headed west, his dominion government established Treaty 7 to free up land for settlers while setting aside some territory to First Nations. Treaty 7 initially envisioned a joint reserve for the Blood Tribe, Siksika and Sarcee — now Tsuut'ina Nation — along Alberta's Bow River. But the Blood Tribe never settled there. Red Crow, the band's chief at the time, told dominion government officials he wanted a reserve farther south in the First Nation's traditional territory. "They wanted their reservation in the neighbourhood of Fort Kipp, where they say their Indians are mostly resided and where the bones of their ancestors lie," Edgar Dewdney, then the Indian commissioner, wrote in 1879. Fort Kipp was at the northern tip of what became the reserve and an important landmark in what the Blood Tribe has long considered its home base. It may have been the dominion government's intention to set up a reserve in the band's home territory, but the exact boundaries would become engulfed in dispute. In 1882, the dominion government dispatched land surveyor John Nelson to formally carve out a reserve for the Blood Tribe. He drew up a territory of nearly 1,700 square kilometres, large enough for almost 3,300 people, under Treaty 7's formula that allotted land by population size. This survey is central to the court battle. The reserve, under the 1882 survey, would have been much smaller than the Big Claim lands, but it would have been roughly 265 square kilometres larger than it is today. The additional land alone is bigger than Regina or Niagara Falls. The reserve would have spread farther south, reaching into what ultimately became the town of Cardston and rural communities. What's under dispute is whether the 1882 survey created the reserve, and whether the Blood Tribe's population at the time was large enough to merit a reserve of that size. The Blood Tribe's lawyers say the dominion government did carry out all the legal steps necessary to establish a reserve using the 1882 survey as the official boundary. Befus said official government reports from the time show the band's population would have justified the reserve that Nelson initially carved out — and then some. "The Crown cannot subsequently take away the lands … except in strict compliance with their legal obligations," Befus said. The federal government takes a different view. Canada's lawyers say the 1882 survey was a draft that was never finished or approved. Panenka said a followup survey, completed a year later, moved the Blood Tribe's southern border to where it is today, because the reserve "had to be sized in accordance with its bona fide population." Panenka said population figures that the Blood Tribe cites were artificially inflated due to recording errors. She said the headcount was corrected in the followup survey that gave the band its smaller territory. The government lawyer said these updated boundaries were clearly defined in an amendment to Treaty 7 in 1883 that the Blood Tribe accepted. Panenka said no one on the First Nation complained about the reserve's boundaries until the Mormon settlers arrived, in 1887. Charles Ora Card led a group of Mormons to southern Alberta after fleeing Salt Lake City, Utah, during a government crackdown against polygamy. In the spring of 1887, they settled near Lee Creek, which is immediately south of the Blood Tribe's reserve, but also inside what is now disputed land. The 1882 survey — which the band argues had created its reserve — would have spread Blood Tribe territory into the land where Card and his followers ended up living, and even farther south. Blood Tribe elder Mary Louise Oka told the Indian Claims Commission in 2004 the story of the Mormons' arrival at what eventually became Cardston. "Many Wives, which are the Mormons, came from the south to this area," Oka said at the time. "They were tired. They used the cows, and that's how they travelled. There were more children than there were men. There were more women than there were men. They asked to see the leader. They met with Red Crow. They asked if they could rest there until summer. They promised to move and they never did. They are still there." The setters' arrival sparked protests from Chief Red Crow, who told dominion government officials he believed the southern boundary of the reserve ended near the mountains at the international border. 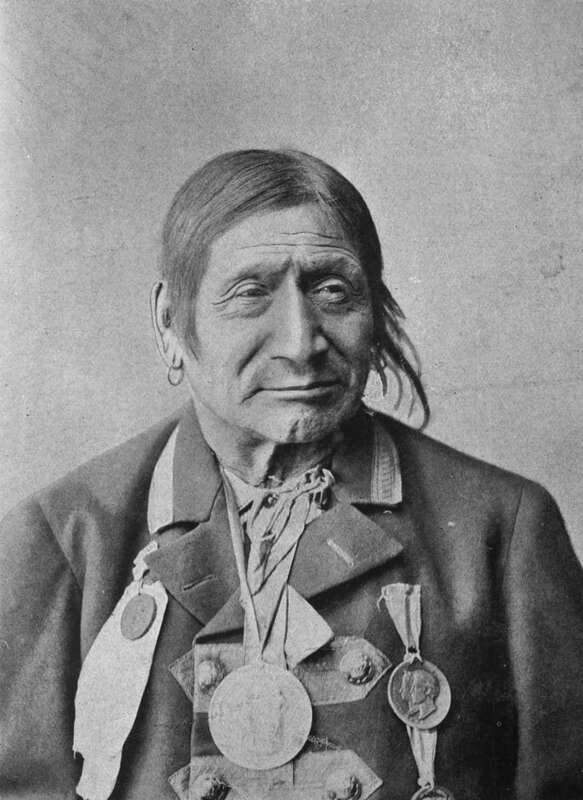 William Pocklington, a federal Indian agent, wrote in 1888 he had told Red Crow "there was far more land in the area he claimed than they were entitled to under treaty. I have explained to him that, as a matter of fact, the present reserve contained far more land than they were entitled to." 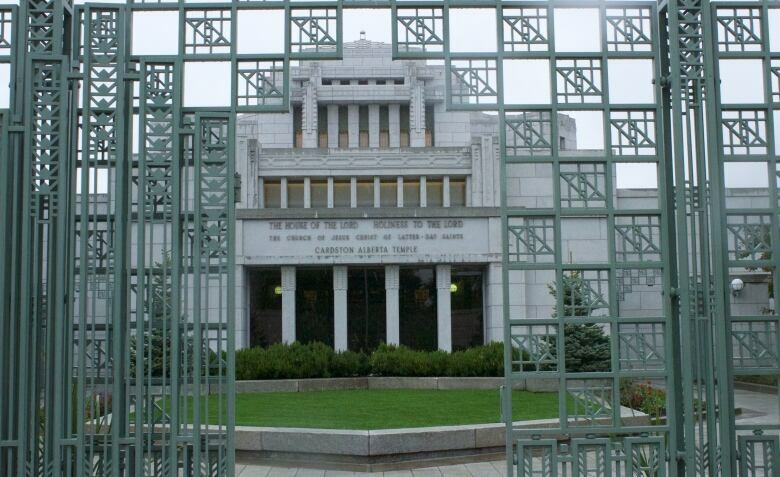 A view of front gates of the Mormon Temple in Cardston, Alta., in 2018. Pocklington showed the chief what the federal government considered the reserve's southern boundary. "Red Crow said he now knew where his reserve ran and was satisfied," Pocklington wrote in a letter to a government official. Despite those reported assurances from more than a century ago, the Blood Tribe has long been unsatisfied about its boundaries. The band has pursued its land claim since the 1970s. The federal government has rejected every attempt, arguing it had no outstanding obligations toward the Blood Tribe under Treaty 7. In 2003, the band asked the Indian Claims Commission to conduct an inquiry into its rejected claim. In its final report, released four years later, the commission dismissed the Big Claim. 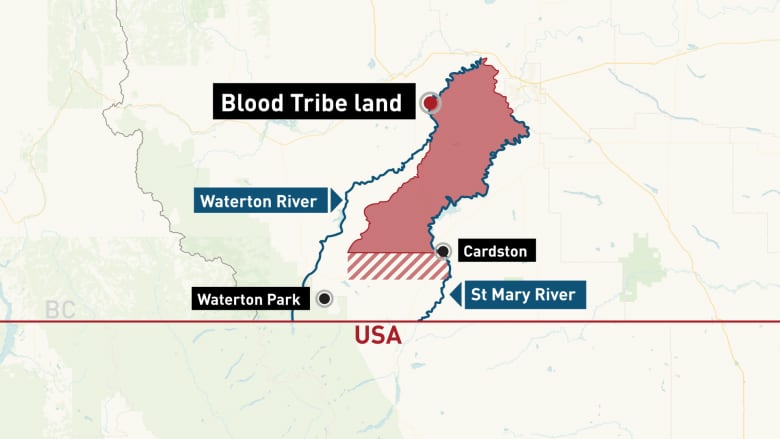 The two-member panel found there is "little doubt" from the Blood Tribe's oral history that the band had desired all of the land between the Waterton and St. Mary rivers. But it said the Big Claim would not have been allowed under the terms spelled out in Treaty 7. The implication is that the band didn't have enough members to justify the massive expanse of the Big Claim. Still, the panel found the federal government breached its fiduciary duty when it formed the Blood Tribe's territory. It said the reserve should have been shaped by the 1882 survey, noting the dominion government acknowledged the reserve had been surveyed and completed by the end of that year. The panel took aim at Macdonald's government for "arbitrarily" shrinking the territory a year later. But the commission's findings weren't binding on the federal government, which refused to accept the recommendations. The Blood Tribe says it had no other choice than to resume its Federal Court case, which had been suspended while the band pursued other avenues. "At the time of the Blackfoot Treaty in 1877 (also known as Treaty No. 7), the Blood Tribe was promised exclusive use to lands in accordance with the terms of the treaty and that promise has never been fulfilled," Blood Tribe Chief Roy Fox said in a written statement. "It is now over 140 years since the time of that promise and the Blood Tribe has been forced to seek a remedy through the Federal Courts." Fox declined a request for an interview while the court case continues. Government lawyers also would not give an interview. In a statement, Indigenous and Northern Affairs Canada said it remains committed to working with the Blood Tribe to "renew" their relationship and "advance reconciliation." "Canada and the Blood Tribe have been working jointly to prepare for this phase of the trial with the shared goal of assessing the validity of the claim," the government said. The trial is expected to end in early July before the judge takes what is expected to be several months to release his decision. Zinn could throw the claim out. But if he believes any part of it is valid, he said he would hold another set of hearings to determine "what compensation or remedy is appropriate." First Nations with valid land claims generally seek compensation based on what they could have earned from the land, dating back to when the land was "wrongfully taken," said Lee Francoeur, a lawyer who has worked on Indigenous land settlements, but did not work on the Blood Tribe's claim. 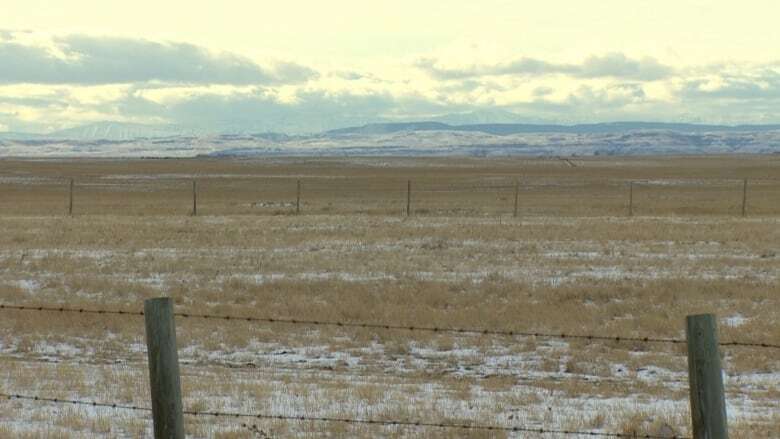 "The courts, generally speaking, recognize that an innocent third party (like a nearby town) probably should not be dispossessed of their lands if it was purchased (legitimately)," said Francoeur, of Eagle Law Group in Calgary. "The argument that I would make on behalf of a First Nation in this case would be, you've got to pay us for what these lands are worth, had the First Nation had the benefit of the highest and best use of these lands," he said. "We would argue that they would have done what was done, which was to create a community." If the Blood Tribe loses this case, it could appeal. If it wins, it could start another battle over how much a town and part of a national park would have been worth to the Blood Tribe over the past 140 years. INTERACTIVE MAP | Did you live near a residential school? Reid Southwick spent 10 years in newspapers reporting in New Brunswick and Alberta before joining CBC in late 2017. In Calgary, he has covered business news, crime and Alberta's fentanyl crisis. Get in touch with Reid by email at reid.southwick@cbc.ca or on Twitter @ReidSouthwick.